This barred owl is a Wing of Hope success story. This fella and one just like him were released at dusk, and I was there to snap this shot of him as he looked back one last time before disappearing into the sunset. If you would like to learn more about Wings of Hope please check out their website. This was one of my 10's. So happy to see you got a posthumous award for it!! I gave you a 10.. this is so wonderful! 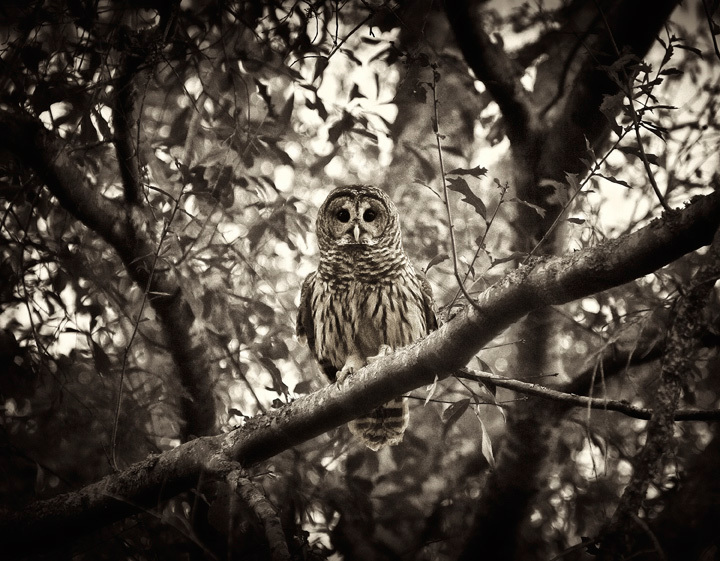 Great capture of the wise ole owl...Changing composition might have added some adventure to the photograph. great use of centered compo, like the toning and plumage tints matches well with foliage. Proudly hosted by Sargasso Networks. Current Server Time: 04/20/2019 10:25:50 PM EDT.